Our offices reside in a 550-ton mansion that was rescued by WHALE and moved to its present location. The structure was stuck for a month in the middle of William Street because of the blizzard of 1978. In 1998, Beauregard, Burke & Franco proudly located our law practice in the Andrew Robeson House in the heart of New Bedford’s Historic District. This Federal style mansion was built in 1821 by Andrew Robeson. Robeson was a leading merchant in the New Bedford area, with successful interests in whaling, banking, and printing. The mansion is a brick and stone example of New Bedford’s prosperity during the whaling years. It was originally located on South Second Street, behind what is now Freestone’s Grill and the Bourne Warehouse. The mansion had an elegant landscape of beautiful gardens. But, over time, the mansion became surrounded by warehouses and other commercial buildings. In the late 1970’s, the mansion was saved as a result of preservation efforts by WHALE – the Waterfront Historic Area League. 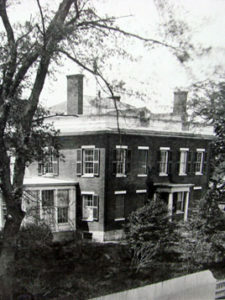 In 1996, the mansion became part of the New Bedford Whaling National Historical Park. Attorney Beauregard became owner of the historic treasure in 1992.